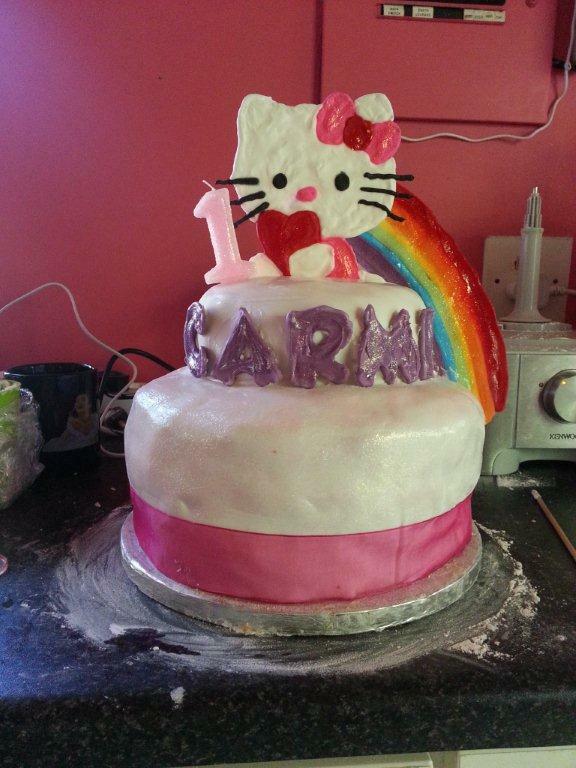 A very special friend of mine gave me the opportunity to make a cake for her daughter's first birthday! 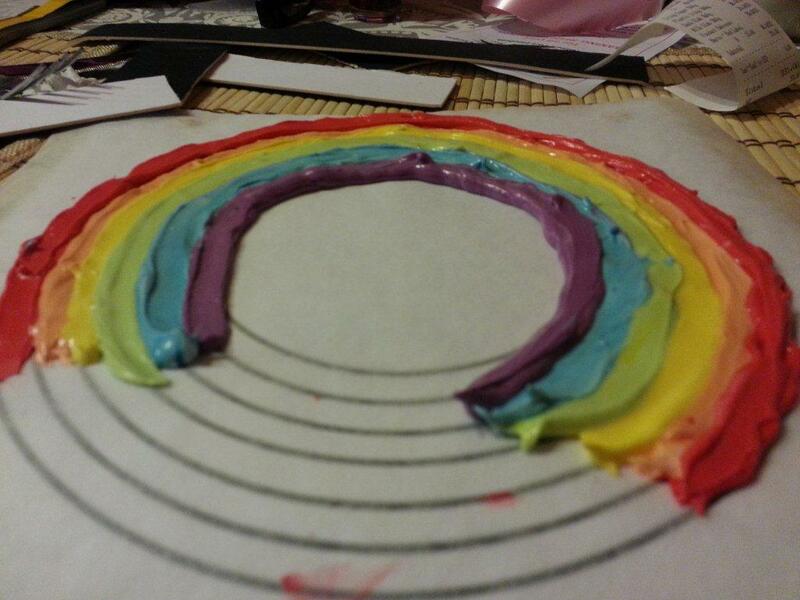 It began with the rainbow cake I made a while back. 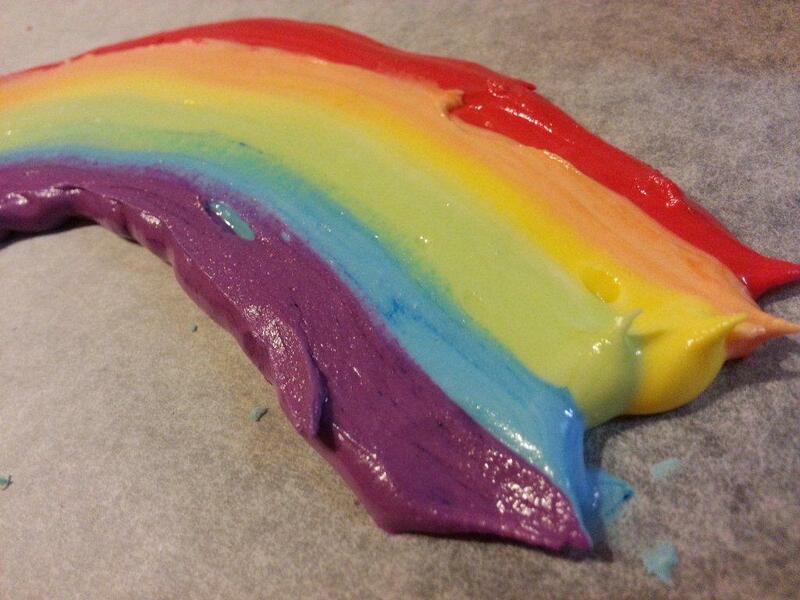 [Check out my Un Gateau du Couleurs post :) ] My friend mentioned she was thinking about having a rainbow cake for her daughter when the time came. So I happliy volunteered. 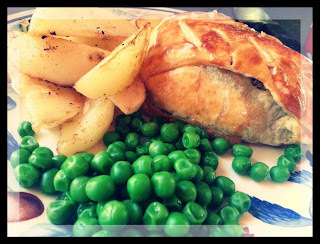 Now this was in Feb... and 5 months later the time arrived to bake.. So the first cake used plastic icing. 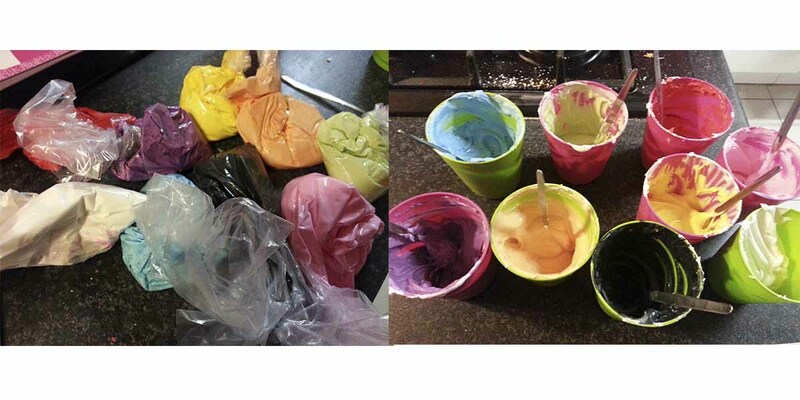 I think its also called fondant icing. I have worked with it before, it is pretty easy to colour. Best to use the powder colour rather than gel. You don't want the extra moisture. :) You can see the cake was rather tall. :) I used 2 x the batter. I didn't like the plastic icing. it was too flimsey to really stand up. Perhaps if I had left it to dry a lot longer perhaps it would have?? I researched a bit more and found a site that used royal icing. 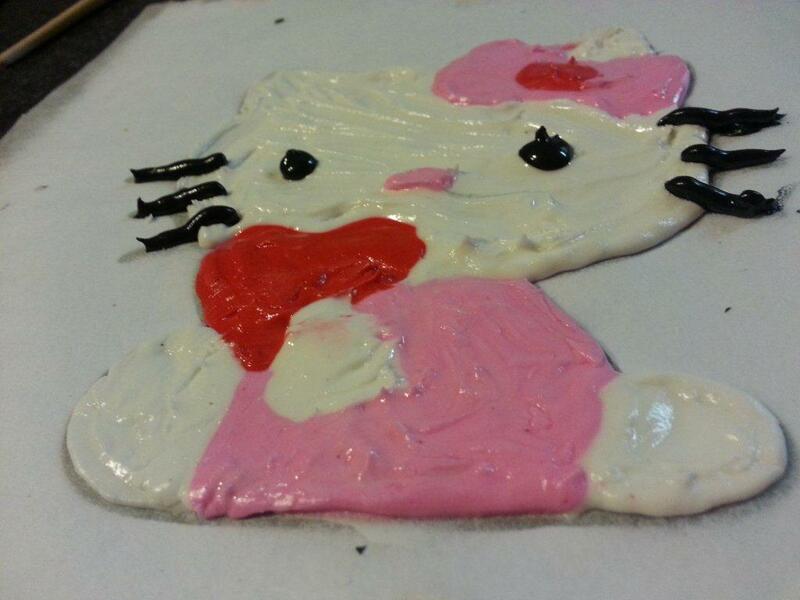 Piped it onto baking paper, let it dry and then placed it on the cake. :) So that is what I did next. I mixed A LOT of royal icing and had fun trying to pipe it. 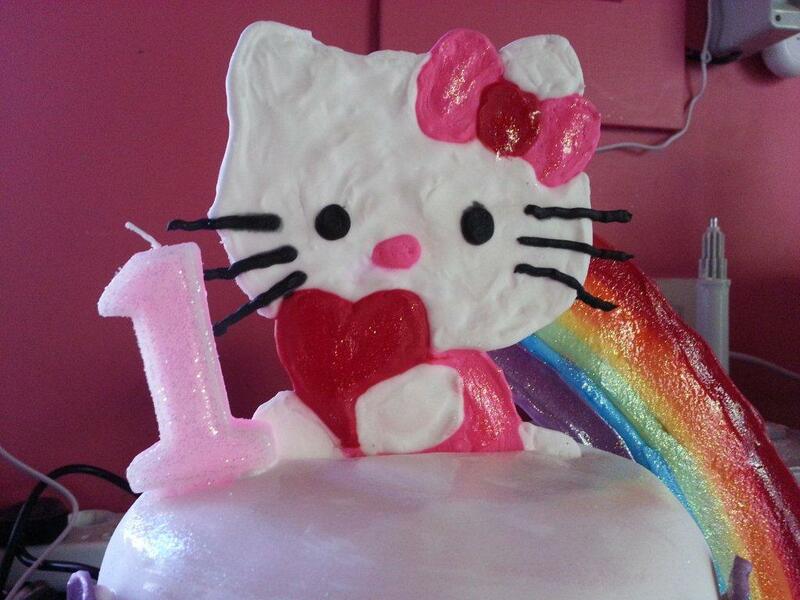 I won't even try to fool you into thinking the "hello Kitty" was freehand. And that reminds me, the hello kitty was added a little later when my friend was looking for the party goodies (serviettes and party boxes etc) She found nice rainbow stuff.... WITH hello kitty - thats how the kitty ended up in the mix! 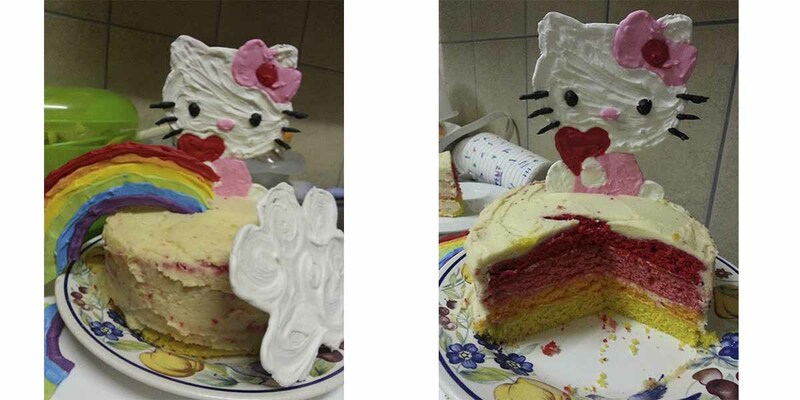 :) If you look at the pics of the piped icing, the Hello Kitty gets better. hehehe... And of course while I was piping all of this, my husband the "art director" was chirping left right and centre about my piping and brush stroked (Used to even the icing)! So the cake was looking better and better. 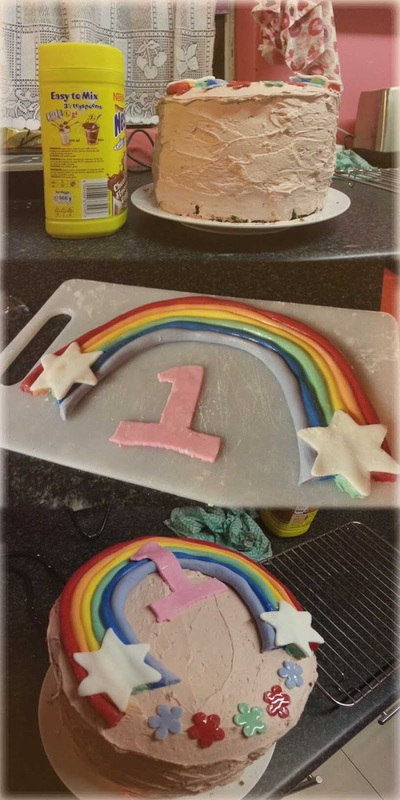 The idea was for there to be 2 different height cakes, with the rainbow going from one to the other. This didn't happen! :( My rainbow kept cracking.... I don't think the curves helped. I am not an engineer but I think the curves added weaknesses in the structure!! 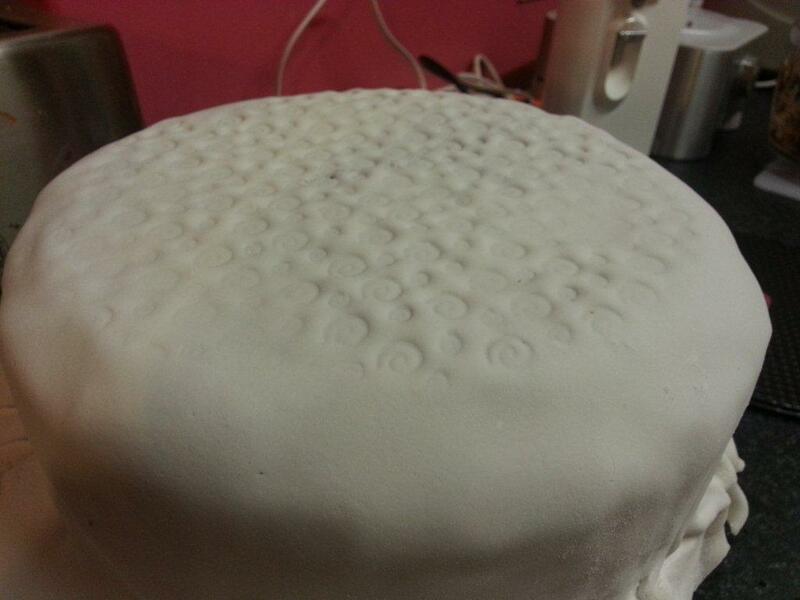 :( So anyway - on the last trial cake, I decided to put the one layer on top of the other! 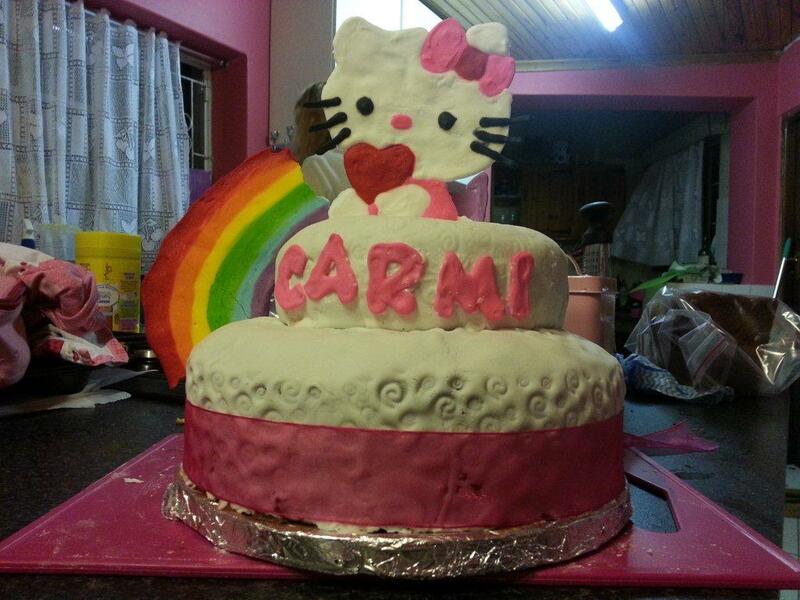 :) For this attempt, I wrapped the cake in the fondant... I got to use my fancy imprinted roller. 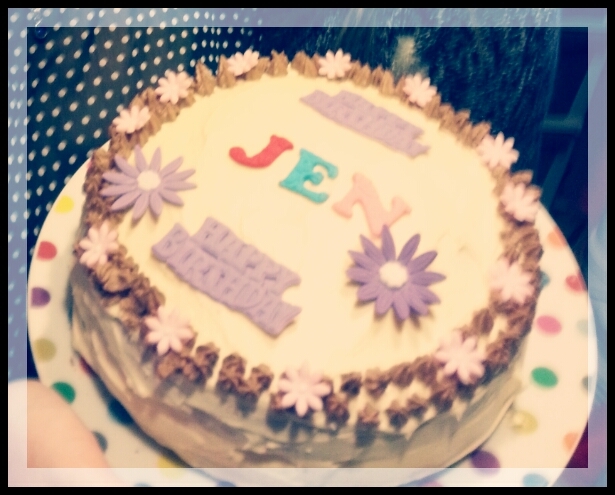 :) it makes fancy swirls on the icing. And then the big day arrived... :) And this was eventually what the cake looked like. The hello kitty was alright... I think the last trial was a little better... Dunno why?? BUT!!!! YAYAYAYAY! the rainbow didn't crack! :) woohoo! I sorta forgot to do the swirls... :( But I made up for it by painting it allover with glitter! Glitter makes everything better. I decided to paint the rainbow with glitter to brighten it up a little... I don't know if you have noticed the blonde in my hair??? I add it there for a reason! hahah... to explain the daft things I do... So I mix a little water with the glitter so I can spread it on... first paint over the red layer... move onto the next... and OH FREAK (or other words) the red started leaking! AHHH... I managed to save it thankfully! But my shattered nerves!!! I am really proud of my cake! My sister told me when I first completed the trial... I sat staring at the cake for a long time! 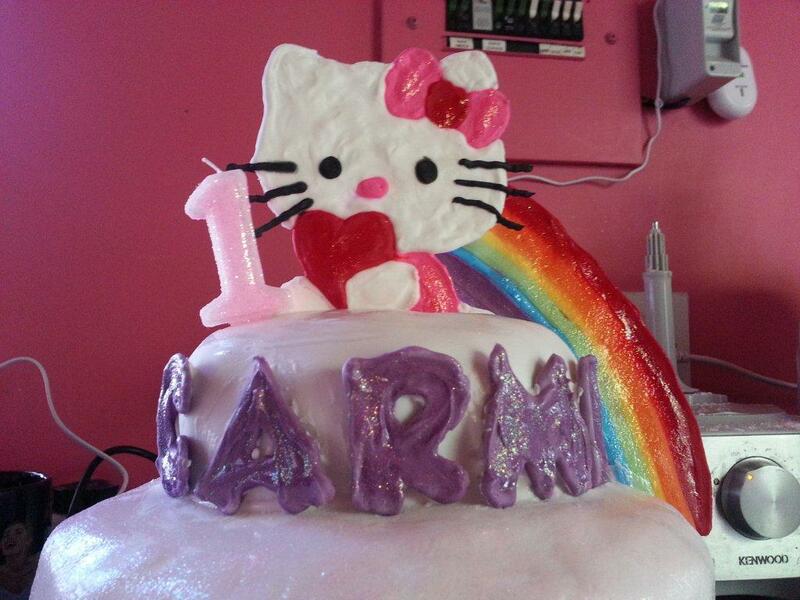 I just can't believe that I could accomplish a cake like this! skills to good use in her kitchen! of cake with his tea in the evenings.